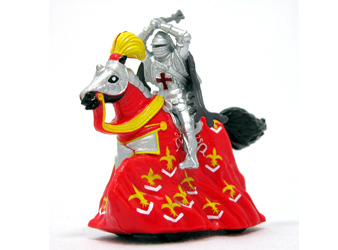 This voluntary recall of three toys included in the Britains brand Knights of the Sword product line is due to potential surface paints on the toys could contain lead levels in excess of federal standards. If you determine that you have one or more of the affected Mounted Silver Knight on Red Horse with Axe, please follow the return instructions. Mounted Silver Knight on Red Horse with Two Hands on Weapon. If you determine that you have one or more of the affected Mounted Silver Knight on Red Horse with 2 Hands on Weapon, please follow the return instructions. 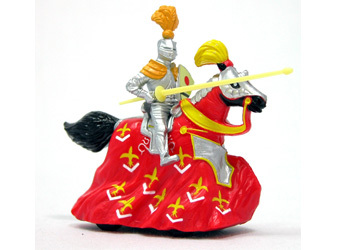 Mounted Silver Knight on Red Horse with Lance. If you determine that you have one or more of the affected Mounted Silver Knight on Red Horse with Lance, please follow the return instructions. If you are having any problems opening the return form, we recommend that you right click on the link and select 'save as' to save the pdf document to your local machine. If you continue to have problems downloading the form, please contact our customer service department at recalls@rc2corp.com and request that it be emailed to you. click here to look up the contact information for your local distributor.